Since I moved to Windows 7 at work, I am still all Mac at home of course. I have noticed issues with upgrading software. Quicktime, Safari, iTunes, MobileMe Control Panel, and other Apple software doesn’t seem to be able to update with the Windows Apple Software Update Utility. If you get an error message telling you Software Updater can’t update your Windows 7 machine just follow these simple steps to install your programs. Option 1.) 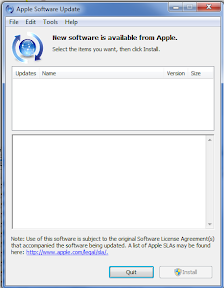 Right click on Apple Software Update and choose properties then click compatibility and check Run this program as an administrator and click Ok. Then open Apple software update and attempt to update your software normally. Option 2.) Click Tools and choose Open Downloaded Updates Folder. Then run each of the updates that are located in this folder down the list in alphabetical order. You should be able to install each component one at a time. After that rerun the Apple Software Update utility to verify you have the latest of everything installed. Hopefully after you have done this updates should start installing again at least until Microsoft changes something on Windows 7 again. Thanks to Tom for mentioning the run as Administrator option. I thought mine was already set but it looks like the Software Update Program being updated clears out the Run as Administrator Option. My guess is that this *might* be happening because the Apple Update utility isn't running as Administrator? I'd be curious if it can do updates successfully if you configured the shortcut to the Apple Update program so it runs as Administrator and tried launching it from there?